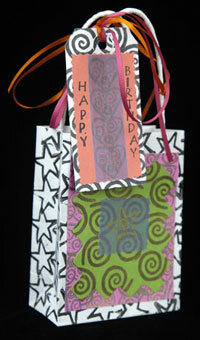 Liven up any plain gift bag and tag with Pearl Ex Stamp Pads and colored paper from Jacquard Products! It’s easy and fun! With the Black Pearl Ex Stamp pad and a star stamp, stamp a pattern on the sides and edges of the front and back of the paper bag. The front and the back of this bag are in different colors, but the stamping is the same. Cut a piece of the bright orange and pink papers a little smaller than the bag size. Stamp with Two Tone Gold Violet in a pattern of your choice along the edges. Let the stamp ink dry and glue one of the papers on each side of the bag. With the large zigzag scissors, cut the bright green and turquoise papers smaller than the previous papers. Stamp all over in a swirl pattern with the Two Tone Gold Violet. Let the stamp ink dry and glue onto bag. We matched the pink and green together and the orange and turquoise together. Cut a small square out of the colored vellum paper and place a single stamp image in the middle. Let dry and glue that to the center of the layers of paper on the bag. For the tag, stamp a swirl pattern all over in Black. Cut a piece of bright orange paper a little smaller than the tag. With alphabet stamps, stamp in Black “Happy Birthday” or some other message vertically along the outer sides of the orange paper. Stamp a line of hearts vertically between the words in the Two Tone Gold Violet. To tone down the stamping, we placed a strip of blue vellum just over the hearts. Attach the tag to the handle of the bag with some brightly colored ribbon.